What seems to be indicative of M. Night Shyamalan’s work, especially over the last few years, is his extreme attention to detail. Whether or not you appreciate his films is a moot point; it’s hard for one to argue that he doesn’t have a handle on what he does, and in The Sixth Sense, the ghost story that became a template for far too many films to follow, his detail-oriented direction certainly doesn’t go to waste. Films like this only succeed, no matter how great the direction or cast may be, if their screenplays do; written by Shyamalan as well, this screenplay may be bold but is weighted by a slight amateur’s touch in the first half. Some of the dialogue is brow-raisingly awkward and (for those who have seen the film, which I’m pretty sure is the entirety of the human race) full of holes, holes so gapingly big that even simple assumption of what the characters may have done off-screen doesn’t help as it usually would. Some scenes are far too short to make the emotional impact intended and others are drastically overlong, but, once that scene hits, once Cole tells his doctor his secret, it’s a near flawless work for the next hour. 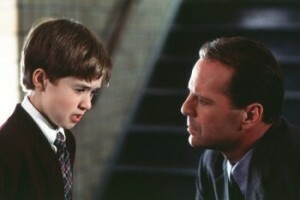 Bruce Willis plays child psychologist Malcolm Crowe, serving Haley Joel Osment’s Cole Sear. We met Dr. Crowe almost a year earlier, having been shot by a former patient in his home; “the next fall,” our leads meet. Willis sets up meetings with the boy, doing his best to rid him of whatever is the matter. There’s a subtle majesty to Willis’ work in almost everything he does; whether it’s gunning down German terrorists or being a jerk to Ross on Friends, he’s always regal. Though it’s a craptastic review, I agree with one point that Roger Ebert made about Willis’ performance, that “not every adult actor can play heavy dramatic scenes with a kid and not seem to condescend (or, even worse, to be subtly coaching and leading him). Willis can.” And it’s true; he gives Osment his space, knowing confidently that the boy can do it, and it works wonders. My personal favorite scene between them is at Malcolm’s office, when he shows Cole a ridiculous magic trick. However, the special mention in the acting category goes to Donnie Wahlberg. Man, oh man, where the hell did that come from? Probably less than five minutes onscreen and it’s something I haven’t forgotten for the past ten years. It’s a true transformation and it shows his extreme commitment to his job. To barely be in the film, but to completely immerse yourself in a character and make him linger forever – or at least for the next two hours or so – is tremendous skill, and he deserves something more than a pat on the back for it. The music hasn’t ever left me, either. I remember watching the special features one day and hearing James Newton Howard talk about Shyamalan’s specific requests for the score. He said he wanted it to feel like a predatory animal, something that hunts freely, and Howard achieved just that. It’s simultaneously bone-chilling and heartbreaking. previousFriday The 13th (2009) – Why Not Just Close The Camp?